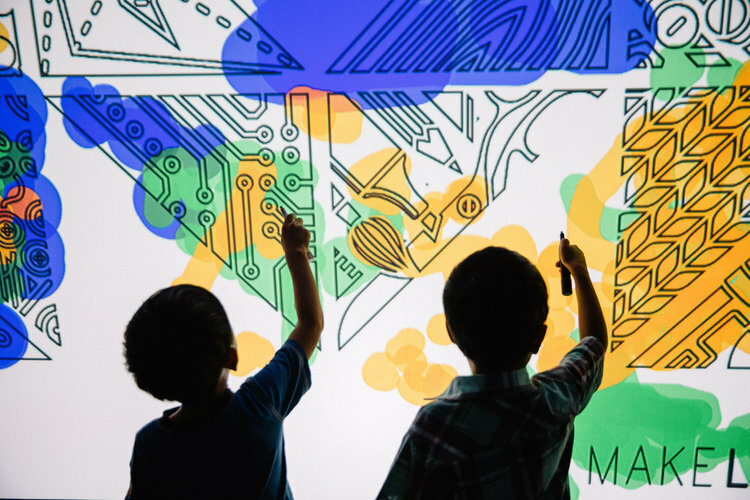 For the iN19 Art Crawl, we are partnering with our first Art Crawl sponsor, RBC to turn a giant 10-foot wide interactive screen into a canvas for digital painting. The Art Crawl takes place entirely in the 401 Richmond building and will begin at Urban Space Gallery at 6pm with the on-site RBC Digital Paintbrush and Canvas featuring art by Inuit artist and illustrator, Germaine Arnaktauyok. Guests can grab digital spray paint cans and paint over custom colouring book page on the canvas. Paint can be blended like real spray paint to allow for anything from simple colouring-in to intricate mural art. The page can be coloured in just a few minutes and guests can share their creative work via email or social media (Hashtag: #iNArtCrawl) and even have it printed on site. The Art Crawl runs until 9pm with stops at six galleries in the 401 Richmond building where you can hear from exhibition curators and attending artists. Guests can enjoy the Digital Paintbrush and Canvas throughout the event. All galleries are located on the ground floor with ramps, power-assisted doors and elevators. Germaine Arnaktauyok is an Inuit artist and illustrator, best known for her prints and etchings depicting Inuit myths and traditional ways of life. In 1999, she designed the special edition two-dollar coin commemorating the founding of the territory of Nunavut. She is the co-author, with Gyu Oh, of My Name Is Arnaktauyok: The Life and Art of Germaine Arnaktauyok. She lives in Yellowknife, Northwest Territories.